Boston Twins: Gotta Get Outside! As long as it's not raining/snowing and provided that the windchill isn't below, well, chilly, we go outside. Winter never bothered me until I became a Mom...especially a stay-at-home one. Be gone winter! 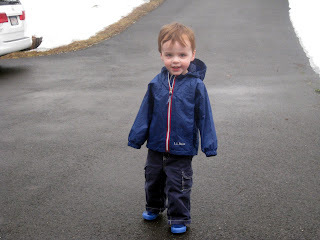 We want to play outside without face-planting into a snowbank or falling into a muddy puddle. (Well that might be fun!) Spring is here...and above, Colin is modeling his new LL Bean mud season gear. I even spied tulip shoots coming up from my fall planting -- oh joy! Alas, Friday's forecast says something like 6 inches of snow!?!? But let's not dwell on that! !